Welcome to day one of SCP Reviews! On bogleech.com, December is considered the final month of Halloween, and it's your second month to submit your own original horror stories! After the success of daily Jojo stand reviews in the same style as my daily Pokemon reviews, "one-a-day" features seem like they're here to stay, and giving some special attention to SCP's is perfect for the season. If you don't know what an SCP is, then our first review will catch you up to speed! The piece was elegantly simple. A bizarre image of an eerie object unfamiliar to most readers, combined with a "leaked document" detailing its unusual and dangerous properties with its own original lingo and terminology. Nerds may note that the sculpture behaves almost exactly like the weeping angels from Doctor Who, standing motionless when observed but moving at lightning speed when an observer so much as blinks, though SCP-173 is both older and a whole lot cooler looking than the angels. 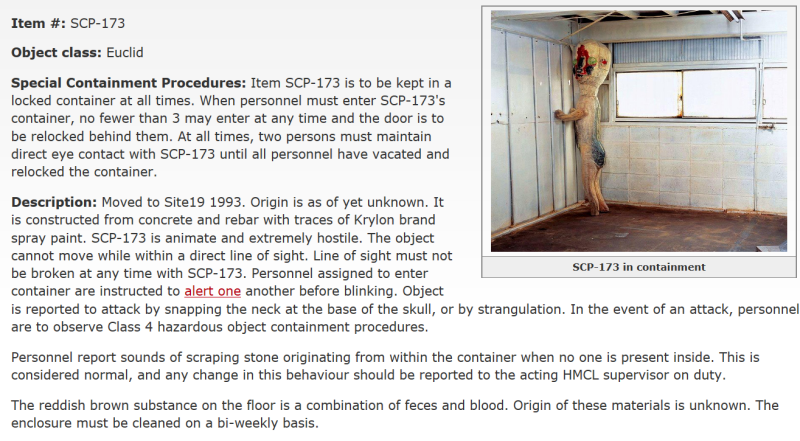 The easy combination of "weird image" and "secret document" was an instant hit, and so many were inspired to imitate the style and format of SCP-173 that its own wiki was put up only a year later, slowly evolving into the Scp Wiki we all know and love today and massively, massively expanding upon what the original writer only hinted at, who revealed himself only the following year and was kind enough to release the original text under a creative commons license. As writers and readers came to understand it, the "SCP Foundation" is much like the "Men In Black" as understood by UFOlogists and Will Smith fans; an all-powerful global organization, distinct from and above any government, who monitor and contain things that should not logically exist in our world. Not only aliens, monsters and murderous statues, no, but things that defy logic and science in every imaginable fashion; from an entire alternate Earth ruined by a con-artist alien god to a couple of slugs that secrete ranch dressing. Far more flexible than those "Holders" ever were and less mired in shock edginess, SCP's run the gamut from pure horror to pure humor, and at the time of this writing, there are now nearly four thousand of them on the wiki, along with hundreds of fiction stories set in the same universe, all thanks to one mystery writer's idea that a big, concrete embryo will break your head if you don't look at it. Of course, much credit must go to the creator of the real 173 - the actual sculpture appearing in the photograph - and that would be the artist Izumi Kato, who has created scores of these beautifully surreal beings through both sculpture and finger painting. The tantalizing strangeness of Izumi's figures is if anything diluted by an attempt to give them further context, let alone casting one as a mere neck-snapping bogeyman, and Izumi himself has only "reluctantly" granted permission for non-commercial use of the image by SCP wiki. Though he has seldom clarified any particular meaning to his work, they're clearly anything but frightening monsters in his eyes, intending them more to evoke curiosity and sympathy. It was even important to him that their first collectible vinyl figures be unable to stand up without human assistance, in order to create a "closer bond" with their owner. I definitely have very mixed feelings about slapping a "horrific" image onto something that wasn't supposed to be horrific, but I also can't deny that Izumi's faces are supremely haunting, and the image of this thing standing in a big, sterile, empty room was a fantastic choice to weave a story around. I see the sweetness and innocence Izumi does in his sculptures, but I also see the sweetness and innocence in the face of a hippopotamus, and you do not want to approach a hippopotamus. SCP-173 is a neat little package of dark intrigue and laid the foundation for an enormous community of authors still thriving since its 2007 debut. As a "creepypasta," it would actually have to earn a solid 5/5 for originality, but as an SCP, we're going to give if a "just right" rating of 3/5, since it stands as only the very baseline of what an SCP can now entail.